When most people think of virtualization, they think primarily, or at least initially, of one-off server consolidation projects. However, almost 60% of organizations also obtain long-term benefits from greatly improved flexibility and agility. This agility and automation in turn can form the basis of self-service IT. As routine tasks like provisioning are automated, business users can initiate build-out of standardized service offerings themselves, on a pay-per-use basis. IT staff, meanwhile, can be freed up or reassigned to more strategic and value-added activities. This in turn can start to form the basis of cloud computing – convenient, on-demand network access to a shared pool of configurable computing resources that can be rapidly provisioned and released with minimal management effort. Looking at the essential characteristics of cloud computing – on-demand self-service, broad network access, resource pooling, rapid elasticity, and measured service – it is clear that Infrastructure Automation, Virtualization, and Service Management are fundamental building blocks for Private Cloud. And a critical and indispensible component of a private cloud is the Service Catalog – such as provided by newScale – providing a menu of standard cloud service offerings and a self-service “store-front” for IT. 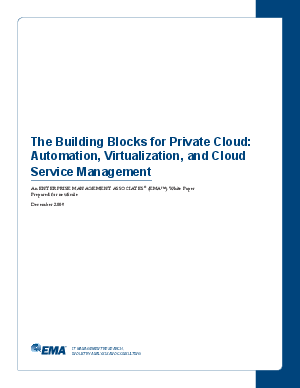 This EMA White Paper examines in more detail these building blocks for private cloud computing – automation, virtualization, and cloud service management – and provides EMA’s recommendations for a phased approach to cloud computing, based on EMA’s maturity model, research data, and enterprise activities, with prescriptive approach and some sample use cases to help get started.